EDITOR’S LETTER Challenges bringing opportunities in the biotech and pharma industry Given the very nature of its business, the biotech and pharmaceutical industry is continuously faced with challenges like cost aspects and stricter regulations. Similarly, these challenges are met with new trends that help navigate these issues and lead to new growth opportunities. Powered by the emergence of bioanalytics and advancements in genetics, the usefulness and safety of biopharmaceutical products have developed the ability to address previously untreatable conditions. This positive shift is therefore enabling the biotech and pharma companies to tackle high prices of drugs with innovative research and developments. Considering the high growth and drastic progress in the biopharmaceutical product development, we have featured prominent companies in our latest magazine, “The 10 Best Biotech & Pharma Companies to Keep an Eye On in 2019”. With their state-of-the-art approach, these leading companies are contributing the biotech and pharma industry. Out of these phenomenal organizations, we are privileged to feature CMIC Inc. on the cover of this magazine. CMIC Inc. has years of excellence in bioanalytical services. The President and CEO, Mike Suga is leading the company with a strong commitment to improving the lives of people around the world, ultimately enabling the organization to prosper with new achievements. 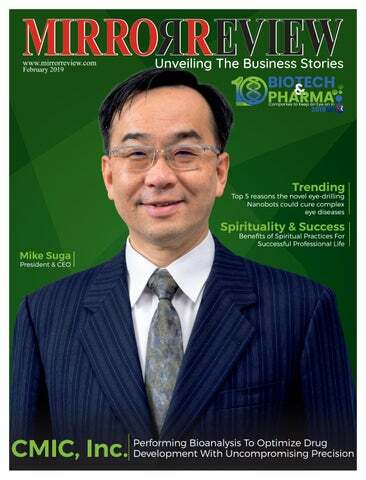 Rolling to the next pages, we have covered innovative stories of leading biotech and pharma companies which are working towards enhancing the industry with advanced researches and products. This time, the team of Mirror Review has invited López Fernebrand (Senior VP, General Counsel & Corporate Secretary/Amadeus) to explain his expert viewpoints. López shared his opinions regarding the essence of technology for sustainable travel industry. As our promise to delight our precious readers with amazing articles, we bring you two articles covering the subjects related to spirituality in life and a novel nanobot technology. I hope you enjoy this info-packed magazine issue. Happy reading! EXPERT’S VIEWS Why technology is crucial to achieving a sustainable travel industry ? n today’s healthcare industry, medicine is becoming more and more personalized with patient focused approach. To drive such a personalized medicine avenue, Biomarker is a good example and a leading contract research organizations (CRO) like CMIC, Inc. have a responsibility to provide bioanalytical data meaningful enough for advanced medicines. We help clients to streamline drug development efforts to maximize success rate by reducing drug development time and costs. Illinois, which is currently known as CMIC, Inc. After the acquisition, CMIC, Inc.’s laboratory in Hoffman Estates completed construction of an additional 5,000 sq. ft. of dedicated laboratory space, bringing its current footprint to 27,000 sq. ft. on over 5 acres of buildable land. Currently, it houses nearly 20 LCMS/MS instruments, bringing the CMIC global count to approximately 50 LC-MS/MS instruments. This addition provides with extensive testing capabilities and sample storage space to support increasing study demands. Managing High Volume Projects with World Class Facility Its Japan oriented-high quality, quick turn-around-time, and ﬂexibility differentiates CMIC from its competitors. Following theses Japanese quality norms, CMIC’s GLP-compliant state-of-the-art facility has grown to accommodate quick turnaround and high volume projects from around the country. Conveniently located in Hoffman Estates only 20 minutes from Chicago O’Hare International Airport, CMIC’s location in the Midwest helps the leading CRO to conveniently serve pharmaceutical and biotechnology companies across the country. humidity monitoring systems, video security and restricted entry, on site or off site archives, building management systems, and state-ofthe-art sample monitoring system (24/7). Friendly CEO Leading CMIC towards New Opportunities “Personalized medicine is out there and it is on us by leading in bioanalytical services that clients can trust to deliver high quality data, rapid turnaround, and unparalleled customer service”, says Mike Suga, the President and CEO of CMIC, Inc., when asked about the utilization of bioanalytical services to enhance personalized medicine. Our mission is to contribute to high quality, efﬁcient drug development and conduct science that contributes to the public welfare. teamwork, dedication, respect, and integrity. These highly educated and experienced scientists work directly with clients’ R&D scientists to ensure the best output from investments. CMIC’s project team is comprised of two technical experts for each assay performed to provide continuous veriﬁcation of the assay conducted. COVER STORY Technical expertise is shared and developed through extensive cross training between CMICâ&#x20AC;&#x2122;s international laboratories. As testing methods and technology continue to improve at a rapid rate, researchers at CMIC are committed to staying at the forefront of progress with on-going education and training. Such regular external training from vendors and industry experts and regular attendance at industry conferences keeps researchers of CMIC up-to-date on the latest technology and techniques. Providing Best-In-Class Results with CMICâ&#x20AC;&#x2122;s Quality Commitment The Quality Assurance Unit (QAU) at CMIC was established to provide data quality and study integrity in accordance with Good Laboratory Practice (GLP) regulations. With more than 20 years of combined experience of inspecting and auditing studies designed to comply with the US FDA and EPA as well as international regulations such as OECD and JMHW GLPs, CMIC QAU staff members are long-experienced Quality Assurance Professionals in Good Laboratory Practice (RQAP-GLP). To assure highquality, each QAU staff member at CMIC receives on-going training and education in Quality Assurance. 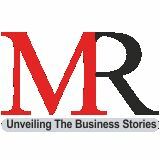 Subscription Form If you wish to subscribe for Mirror Review Magazine, kindly ďŹ ll out the below form and email/courier along with a cross check amounting USD $200 annual subscription including courier charges in the favor of Mirror Review Media & Technology. We strive to develop products like AVM0703 that will end human exploitation in biomedical research and medical treatments. aspects, Theresa takes care of fund raising for new developments and improvements in the existing programs at AVM Biotechnology. Strategies to Reach UnderDeveloped Nations with New Partnerships When asked about her long term plans for AVM Biotechnology, Theresa said that they have plans to partner with a global pharmaceutical company for worldwide clinical development and commercialization of AVM0703 and their second generation candidate. An important part of their long-term mission is to provide AVM therapies to underdeveloped regions of the world. Additionally, Theresa and her team are working on accelerating clinical trials in autoimmunity and use of AVM0703 as a non-toxic preconditioning agent to optimize stem cell regenerative effects. For this, they are leveraging clinical dosing and safety data from relapsed/refractory lymphocytic blood cancer patients, where FDA commercial approval is rapid. The revenue generated from AVM0703 will be used to drive another development program leveraging induced pluripotent stem cells (iPS). This program will be useful for general and patient-speciﬁc biologic manufacturing. Likewise, AVM Biotechnology will partner and collaborate with companies who are developing novel bioreactors and NGOs to solve supply chain limitations of vaccine provision in under-developed countries. on spirituality written by Florence Scovel Shinn, the subconscious mind needs programming, and if it’s not done then someone else will program it. Nowadays, without spiritual practices, people let others do the programming through the social media, news, and other informative mediums ﬁlled with a mixed type of expressions, which disturbs the focused thought process of an individual. The morning practices make the mind more focused and program it in such a way that the employee can sustain the new work challenges and unexpected events throughout the day. The start of the day with these spiritual practices awakens the individual and makes him realize the happiness and peace within by detaching him from the deep dreams of other attractions. To make the mind feel great and alert throughout the day, starting the spiritual practices early in the morning after a complete 8 hours of sleep is beneﬁcial as it is very peaceful and quiet in the morning. After starting to wake up early in the morning, it becomes a supplement for the healthy expansion of the entire life. Committing few spiritual rituals every day can absolutely change the life in a positive way. Sometimes, it’s difﬁcult to meditate just after waking up, because many people go back to sleep while meditating. Taking a simple tea can change the entire ritual, because the caffeine in the tea is a perfect wakeup call so that one can work without dozing off. Those who don’t like tea can sit and write something to regenerate the energy. Writing opens the thoughts and ideas in the mind. If an employee is going through a tough time, writing is the best solution to ﬁnd out the best solutions. If the employee is ﬁlled up with negative thoughts and emotions, which are not serving him, then there won’t be enough space available for receiving the desired outcomes. Imagine a glass of dirty water ﬁlled to the brim. If one needs to add pure water in it, then it’s not possible to add pure water in an already full glass. The same is true for the mind. When the mind of an employee is full of worries, anger, grudges, judgments towards co-workers or himself, he won’t be able to utilize and think about pure thoughts of contentment, because the mind is already engaged in thoughts related to other negative feelings. It is essential to trash out such negative feelings to welcome positive things to happen. Finding a practice which releases negative emotions is the best way to deal with the negative thoughts because only a calm and happy mind can understand the inner intuition or the gut. A clear and happy mind helps employees understand how they feel about new tasks, projects, and organizational activities. There is a close relation between good thoughts and job satisfaction, because, in work, the positive organizational purpose is signiﬁcantly associated with job satisfaction. With an increase in workplace spirituality, employees’ commitment increases towards the organization. For many years, spirituality and leadership were worlds apart. While spirituality concerns with intangible ideas and emotions, leadership is a practical area of scientiﬁc inquiry. However, a large number of evidences from studies show that these ﬁelds are much closer, and there is a transition between the two ﬁgures. A good leader needs to evaluate the situation and act accordingly. The key elements of modern leadership involve cooperation, consideration, agreement, and social quality. The new adaptability culture requires a leader to be autonomous, take initiatives for improvements and emerge with new objectives and strategies. There is growing interest in the issues related to the spirituality in the workplace. The spiritual values such as integrity, honesty, and humility have a great effect on leadership success. The practices which have been emphasized in many spiritual teachings, and found crucial for leadership development are: showing respect for others, demonstrating good treatment, expressing caring and concern, actively listening, recognizing and appreciating the contributions of others, and engaging in reﬂective practice. Leadership and spirituality play an essential role together in terms of ethics and values. Value-based leaders have the ability to utilize employee efforts and organizational goals more effectively by connecting them to the deeper values inside them. They motivate employees and improve their performance and commitment towards the organization by making them imagine a better tomorrow. The spiritual rituals have an uncanny ability to set the human mind for the rest of the life. These spiritual practices also give a loud and clear message that the professionals in organizations should be versed with their core values through a positive vision and personal actions. People commonly believe that there is a conﬂict between the values and practices included in spirituality and those required for successful business, but the above article explains the huge similarity between elements of success in both ﬁelds. Therefore, by incorporating these spiritual practices in professional life, employees can align good values with the strategy and roadmap to achieve massive success in the business. manufacturing and sales of monolithic chromatography columns. Its columns comprise a range of large molecule isolation and puriﬁcation products used in the development and production of gene therapy including Cas/Crispr, CAR-T, on colytic/viral vaccine, phage, exosome, and plasma products. The leading Slovenia-based company provides customers with signiﬁcant yield, purity, cost, and process speed advantages over competing technological solutions as well as usage ﬂexibility in downstream processing of pDNA, viruses, VLP, phages, exosomes, and large proteins. BIA Separations’ unique polymer composition, precise ﬂowthrough channels, and high surface accessibility of binding sites result in elevated binding capacities, exceeding those of resin-based columns and allowing rapid mass transfer with very low shear force effects and product degradation. BIA Separations’ columns are differentiated by their ﬂow independent performance, resulting in fast separation, concentration, puriﬁcation, removal, and analytics of biopharmaceuticals. Additionally, they are available in different designs and capacities to meet the speciﬁc needs of its client base, which ranges from small-scale laboratories to fullscale manufacturing facilities. We offer a whole toolset for chromatographic analyses of molecules in up and downstream processes in minutes. BIA Separations’ facilities are fully equipped to handle process and analytical method development for particles up to biosafety level 2. Considering clients’ demands in mind, its sales and technical support team prepares a work plan as per their requirements. Moreover, clients’ may choose to be involved throughout the development via regular contact with the project manager. 2. Downstream Process Development: Ÿ Processes suited to different clinical phases up to market supply are developed exclusively on monolithic columns starting from lysis or capture to ﬁnal polishing and formulation of biomolecule like viruses, pDNA, bacteriophages, extracellular vesicles, proteins, PEGylated proteins, etc. Ÿ Depending on clients’ products and requirements, the multistep process includes development of lysis method, chromatographic media selection and optimization, virus inactivation, ﬁltration, and tangential ﬂow ﬁltration. Ÿ Recommendation of suitable analytical methods. Ÿ Tech transfer of standard operating procedures (SOP) to client’s facility or CMO. 3. HPLC Analytical Methods: Ÿ Methods for in-process control (PAT), which are developed to increase control, improve efﬁciency, and prevent rejection of batches of upstream and downstream. Ÿ Methods for ﬁnal control that enable real-time release of products. Ÿ BIA’s HPLC methods use CIMac™ Analytical Monoliths and are developed on PATﬁx™ along with reference methods for characterization. All these methods can be validated. o you believe in the importance of a sustainable travel industry? The travel and tourism sector is expected to grow at an annual rate of 3.9% over the next decade. That is positive, but it also reminds us that we need to put in place measures to guarantee the sustainability of the sector in the long term. Amadeus takes this very seriously. Let me tell you why. We consider that a company’s responsibility goes beyond securing the growth of its results. At Amadeus we have a record for many years of limiting the environmental impact and optimizing the social reach of our commercial operations. We believe that environmental efﬁciency has to start with our internal operations. That is why we measure our environmental impact in order to identify improvements and implement solutions. Since 2009, we have been using the Amadeus Environmental Management System (EMS) as a solid methodology to analyze all our environmental data and help us identify and take measures to improve environmental performance. As a technology provider for the travel and tourism sector, Amadeus develops technology solutions that help our customers improve their environmental and economic efﬁciency. One of our technology solutions, Amadeus Altéa Departure Control-Flight Management, allows airlines to accurately calculate the fuel they need for a given ﬂight, allowing them signiﬁcant savings in CO2 emissions, fuel and economic costs. To achieve greater long-term results, we collaborate with other interest groups in the travel industry and participate in projects to improve environmental sustainability. For example, in order to help achieve the 2-degree objective set by the Paris Agreement and reach the carbon neutral level, Amadeus joined the United Nations’ Climate Neutral Now commitment. We have also established a long-term agreement with the International Civil Aviation Organization (ICAO) to contribute to a greater awareness of carbon emissions in aviation. Amadeus uses the ICAO carbon emissions calculator on its distribution platforms to provide travelers with information on the greenhouse gas emissions produced during their trips. their trips online. So far, travelers have donated almost 3 million dollars on the websites of Iberia, Finnair, Norwegian, Almundo and Avianca for programs to educate and vaccinate of children, and other development projects run by the United Nations Fund for Children (UNICEF). We also contribute our knowledge in travel intelligence for initiatives that beneﬁt society. In this sense, Amadeus is part of a UNICEF global innovation program that collects and analyzes complex data sources from different sectors. In part, thanks to the data provided by Amadeus, they can better understand the patterns of the spread of epidemics, which helps them to control possible outbreaks in other areas. Our purpose to shape the future of travel and tourism is based on internal, external and collaborative actions with other entities in the sector. We are committed and proud to be able to use Amadeus’ technology, experience and global network to ensure the sustainability of the travel industry in the long-term and build a better future for all. andoz is a global leader in generic pharmaceuticals and biosimilars. As a division of Novartis, its purpose is to discover new ways to improve and extend people’s lives by pioneering novel approaches to provide access to high-quality medicines. Global headquarters are in Holzkirchen, Germany and US headquarters in Princeton, New Jersey. President, Sandoz US & Head of North America, Sandoz Inc.
of an originator reference product in the US and remains in the top spot in volume share. Carol Lynch, Leading the US Transformation of Sandoz Carol Lynch has worked with Sandoz and Novartis for more than 20 years in various roles across several continents. Due to her dedication and extensive experience with Sandoz and Novartis, Carol became President, Sandoz US, Head of North America, Sandoz Inc. in March 2018 and is a member of the global Sandoz Executive Committee. Carol oversees commercial operations in the US (the largest commercial and country organization) and Canada and looks after 35% of Sandoz’s global revenue. We contribute to society’s ability to support growing healthcare needs by pioneering novel approaches to help people around the world access highquality medicine. team of scientists created specially coated nanometer-sized vehicles that can be used to move through dense tissue of the eye. Until now, scientists have successfully transported nanobots or nanovehicles in model systems or through biological ﬂuids. This is the ﬁrst time nanobots could drill into a real tissue of eyeball. These nanobots are just 500 nm wide and they can easily roam through the tight molecular matrix of an eye. To go further, a clear idea about nanobots is essential. What are nanobots or nanorobots or nano-vehicles? Nanobots are the robots of size close to the microscopic scale of a nanometer (10−9 meters). So far, nanorobotics considered as hypothetical nanotechnology engineering discipline of designing and building nanorobots. When nanobots in medicine are considered, the most popular idea is self-propelled nanomotors and other biodegradable nanodevices made of bio-nano components. They are used to carry cargo to the target sites. It means they deliver drugs to diseased cells. A size which can easily roam inside an eye Covered in a non-stick coating, these nano-drills are 500nm wide size approximately matches the mesh size of the network in the vitreous. They are helical in shape and 200 times smaller than the diameter of a human hair. This size is even smaller than a bacterium's width. Researchers call it slippery micro-propellers. The ﬁrst ﬁlm of slippery coating on these nanorobots consists of molecules bound to the surface, while the second is a coating with liquid ﬂuorocarbon. This clever combination enables the nanorobots to go through the tight mesh of the eyeballs dense tissue. Slippery surface coating inspired by nature Most tissues including the vitreous have a tight macromolecular matrix that acts as a barrier and prevents its penetration. Surprisingly, the slippery coating on these nanobots removed this barrier of penetrations. This enables the nanobots to move in the vitreous seamlessly. The slippery exterior allows them to be actively propelled through the vitreous humor to reach the retina. Primarily, all this happens without damaging the sensitive biological tissues around them. One of the authors of the study, Zhiguang Wu explains, “For the coating, we look to nature for inspiration”. Targeted delivery Traditional delivery methods rely on the random, passive diffusion of molecules. These methods do not allow for the rapid delivery of a concentrated cargo to a deﬁned region of the eye. The use of particles promises targeted delivery but faces the challenge of macromolecular resistance. outcomes are the results of the dedicated efforts made by Vitro’s talented CEO and his skilled team. Through its outstanding portfolio of products and services and exemplary contributions to the healthcare industry, Vitro Biopharma has received several elite recognitions. In 2014, it was recognized by Frost and Sullivan as a “Thought Leader in Stem Cell Tools & Technology” in North America through the Receipt of a Technology Innovation Leadership Award. Similarly, the company was also recognized for its accomplishments in stem cell lines and media for supporting global stem cell research and its innovative stem cell activation technology. The company has numerous national and international patents and patents pending on its intellectual property. Dr. Jim Musick, the President and CEO of Vitro Biopharma, is currently handling the operations of this rapidly growing stem cell ﬁrm. Along with his committed team, Jim is involved in research & development and oversees the essential processes including intellectual property development, marketing, sales, business development and new product releases. Vitro Biopharma provides and continually improves the highest quality stem cells and related products and services in accordance to government regulations. With his mission to ease patient care, Jim proudly asserts, “My greatest pleasure comes from seeing a patient’s favorable response to our stem cell therapy. We are beginning to see advances in diseases with limited or not treatment options other than stem cell therapy” Additionally, with these continual positive outcomes and deep insights, Jim is currently working towards expanding Vitro’s presence in international medical tourism while simultaneously pursuing opportunities in the US markets such as a new cosmetic stem cell serum product.